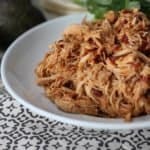 Adobo Chicken is a fantastic make ahead ingredient that will quickly become a staple in your diet. It is easy to make, requires two ingredients, and keeps for months in the freezer – if it lasts that long. Spring is finally here on the northern prairies! I’d love to say a little bird told me, but thousands of birds flying over my pasture and my favorite flowers popping up are a sure sign. I love crocuses because it means spring is really here. I’ve seen them pop up early in April, or in May just before school got out. This year they’ve been a little late. They have been growing very tall lately. Family lore tells me that the taller they are the wetter the year. We could sure use some rain on the prairie, so I’m hoping that this legend holds true! I don’t get to spend much time in the kitchen. 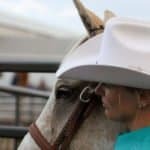 Instead, I spend my evenings and weekends working with my horses, and beautifying the farm yard. That is why I love this Adobo Chicken. I can make a quick batch and pop it into the freezer. My Adobo Chicken is incredibly simple to make and cooks up quick. You don’t have to mess with a marinade and the chicken has so much flavor. 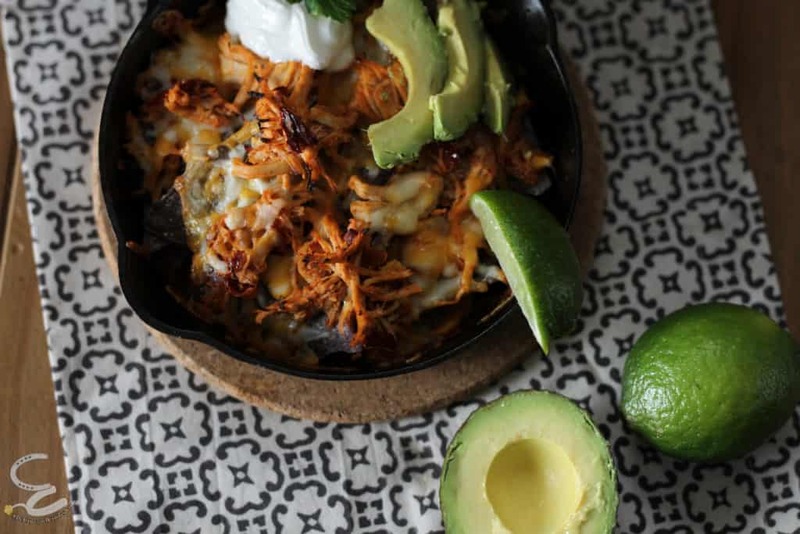 It is fantastic on Nachos, a tostada, in a spring roll, as part of a tex-mex baked potato, or even potato skins… The possibilities are only limited by your imagination. Lately I’ve been cooking this up in my electric pressure cooker to save even more time. I don’t want to leave my oven running un-attended but I have no qualms about starting my electric pressure cooker and getting back to work. My gluten free lifestyle has made me a big fan of kitchen shortcuts. If you haven’t given in to the electric pressure cooker phase, bake the chicken in the oven. I have to make something for every meal, because take out, delivery, and the typical supermarket convenience food isn’t an option for someone with celiac disease. If I’m going to make something, It might as well be something deliciously quick! Adobo Chicken won’t let you down. It is meal planner’s dream. 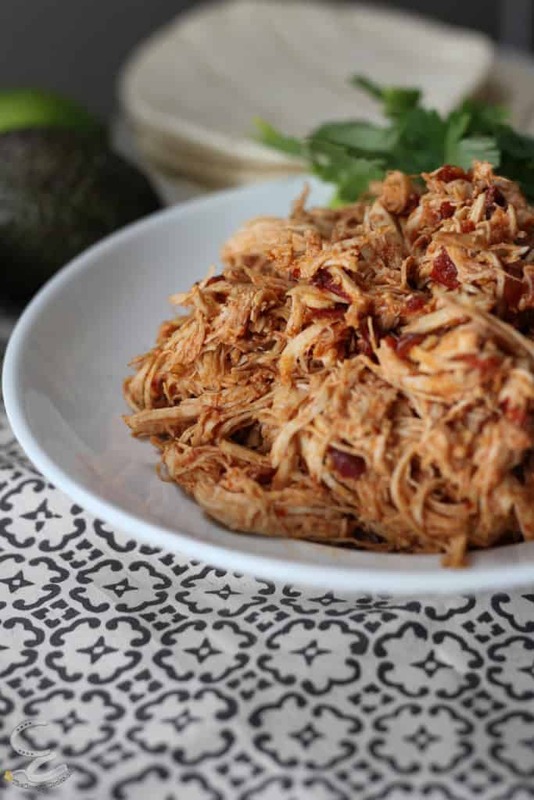 My husband loves it when I leave a bag of adobo chicken in the freezer because it is so easy to make a quick meal. All you have to do is pop the chicken in the microwave for 30 seconds and it is defrosted. Adobo Chicken is great on Nachos. Give this a try in tacos or with your favorite enchilada recipe this week. Maybe try both. Or bring a batch on your next camping trip. You won’t be disappointed. Adobo Chicken is one of those make-ahead ingredients you won’t want to run out of. 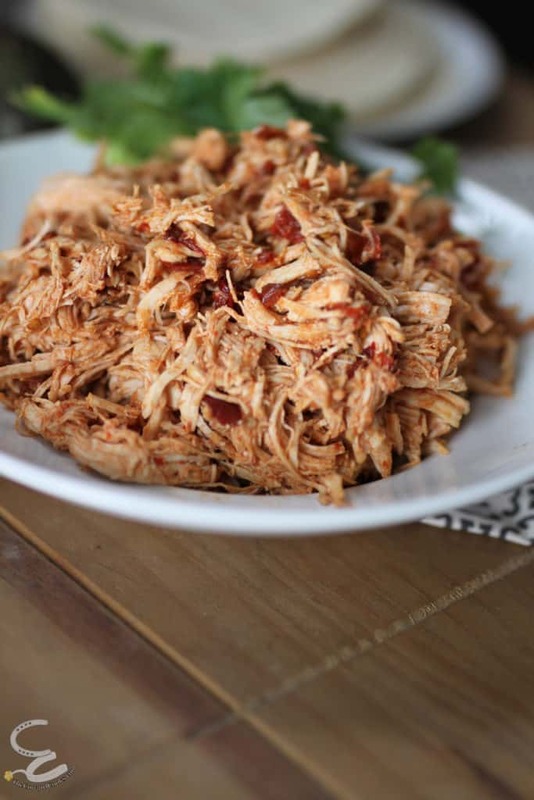 I use my pressure cooker for perfectly shredded chicken but you could easily bake it in the oven. Place chicken breasts in pressure cooker and cook on poultry setting, 10 minute. Shred chicken with two forks scraping the meat with the grain. Then place in a large mixing bowl. Open the can of chipotle peppers and sauce, remove the peppers, set aside the sauce, and mince the peppers to pieces about the size of a pencil eraser. Add minced peppers and sauce to shredded and well. Optional – place chicken mixture onto a cookie sheet in small clumps to freeze for easy serving then place in a plastic bag – or freeze in a plastic bag. If you love this recipe post a picture, and share on Social Media with #CowgirlCooks.